How Many Times a Day Should I Feed a Lab Puppy? Adding yogurt or cottage cheese to a pup's dry food can increase his protein intake. Your Labrador puppy is a growing boy. His appetite level will go up and down as he navigates the growth process. Some days he will eat copious amounts of food, leaving you to think his hunger will never be satisfied. On other days, when growing pains bother him, he might eat little. Before addressing how often to feed a pup, it is important to first figure out where in your home the feeding will occur. Many people mistakenly select the kitchen or dining area, according to Labrador Retriever Facts. Humans assume that because canines' ancestors lived in packs, they want to eat together. Fact is, this proximity to the activity of food preparation, and to everyone else finishing off their plates, makes dogs wonder whether their chow is safe from being snatched. It's better to let Labrador puppies eat in an out-of-the-way location where they won't feel rushed. For the pup's first eight weeks of life it is best for him to nurse from mom. Her milk is specially formulated to meet his needs and those of his littermates. 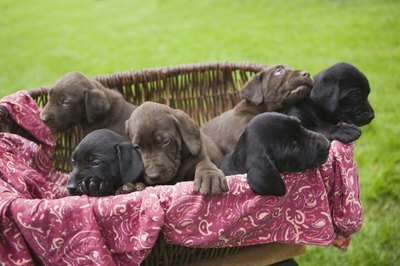 As the weaning process begins between six and eight weeks of age, with puppy chow offered as a transitional food, feeding three to four times a day is recommended by the Dog Breed Info Center. Once mom has cut him off and your pup has accepted his new source of nutrition, it is acceptable to feed him twice per day. This transition to fewer daily feedings happens sometime after 2 months of age. Between 3 and 6 months of age, puppies begin to teethe. This makes them finicky and irritable. The Dog Breed Info Center recommends close monitoring to ensure that the pup is eating when food is given. Some human companions worry about their puppies gaining too much weight, thus setting them up for a lifetime of obesity. Susana Labradors of Simi Valley, California, recognizes that Labrador hip problems are linked to extra weight, but the breeder tells puppy owners that this is a problem for the adult years. Go ahead, let your puppy fatten up a bit, Susana Labradors recommends. He will burn it off as he grows. Combine this advice with plenty of exercise and play for your young four-legged friend, and weight shouldn't be a problem. The Dog Breed Info Center's basic feeding guide recommends using an 8-ounce cup to measure out food. Adult Labradors weighing between 50 and 75 pounds require two to two and a half of these 8-ounce measurements. Puppies -- especially in growth spurts -- can consume up to twice what their adult counterparts do. That means a Lab pup could eat five 8-ounce servings. It also means that the pup might eat less, particularly when he is between growth spurts, teething, or feeling ill.
How Old Is a Puppy When He Stops Biting?